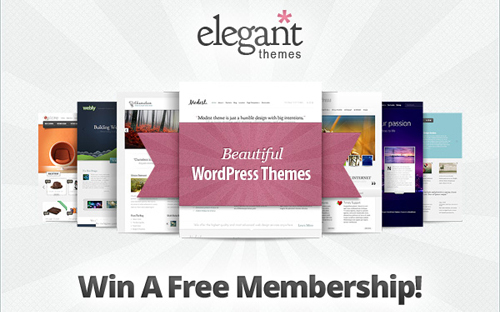 This month,we have teamed up with Elegant themes to offer you an unmissable giveaway.3 (three) lucky winners will get a Developer account which are valued at $89 each.These accounts get access to all of ElegantThemes products including updates and support for a full year. Elegant Themes is one of the leader companies in premium wordpress themes industry.They craft WordPress Themes with a pixel-perfect eye for detail and a high standard for aesthetic excellence that helps you make your website amazingly simple, beautiful and professional.As of 2103 they have 82 high quality wordpress themes for all your needs. Theme options panel comes with all of themes, allowing you to easily control your website without ever touching a line of code. With our large collection of shortcodes, you can create beautiful and complex layouts with ease. This will greatly improve the functionality and variety of your content without the frustration that comes with learning advanced web development techniques. Each template can be applied to an individual page, transforming the way it looks and functions to create additional and unique forms of content. As long as you are a member of ElegantThemes, you can be sure that your theme will always be compatible with the latest version of WordPress and the most recent web browsers. Just comment on this post with your desired e-mail.The contest will end on 05/15/2013.3 (three) luck winners will be chosed uısing random.org. Sty hungry. Stay foolish. Stay houston, we have problem! Well, i’m new to building websites on CMS. During last 3 weeks i was searching the Internet all the way around to find the perfect themes for my projects. And there are plenty of themes around the Internet, you know that. What happen? I found them all on ELEGANT THEME. So hey, i really need to win this access. Great tools, great design, great customizing. Let me have it! Oh thats fine. I hope I’ll win. it is gonna be me! Nice! I would like to win the Developer Accounts. Would love a Dev Membership to Elegant. Some really nice themes. That would be nice to win!!! Elegant Themes is the premier theme shop on the planet. This is not an opinion. It’s a fact. A developer account would be bloody brilliant. Elegant Themes is one of the finest theme creators around. Pick me, Choose me, Gimme!!! Would love to win this. Great for my work! Hope to be the lucky one! I really enjoy all your content, im a recent reader And now this! You’re just awesome! Need that stuff more than girlfriend! Thanks for the contest. Let us see who is lucky. I hope to win this, it would be awesome! For sure it would be dope to win this. Count me in.